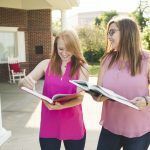 As an alumna member of Alpha Sigma Alpha, there are many ways to connect with your sisters, make new friends, cultivate old friendships or volunteer your time and talent to help continue enriching lives and changing the world around you for the better. Your membership is a lifetime commitment and with that comes the promise that wherever life takes you, you will find a sister to share life’s journey. Alumnae chapters and associations throughout the nation offer opportunities for continued leadership, scholarship, sisterhood and service.